Pleading the Sixth: Williamson County, Texas settled a class action lawsuit alleging that judges engaged in a “systematic and deliberate scheme” to deprive “persons accused of misdemeanor offenses of their right to be represented by counsel.” By agreeing to set up systemic assurances that appointment procedures will be transparent and that defendants will no longer be encouraged to talk to a prosecutor without a defense attorney, Williamson County ends their ”no counsel courts.” Perhaps other jurisdictions can learn from their past mistakes. On January 15, 2013, a settlement was filed in the Texas courts ending a 2006 class action lawsuit, Heckman, et al. v. Williamson County, brought by the Texas Fair Defense Project against Williamson County, Texas (Georgetown) alleging that the county failed to “inform persons accused of crime of their right to counsel,” provided “inaccurate and misleading information about the right to appointed counsel in order to discourage requests for counsel,” encouraged defendants “to waive their right to counsel and speak directly to prosecutors,” and threatened defendants who “asserted the right to counsel” with financial sanctions, while delaying or denying appointment of counsel to individuals who were “eligible for court-appointed counsel under Texas and federal law.” The Texas Indigent Defense Commission (TIDC) reported that Williamson County appointed attorneys in only 8% of all misdemeanor cases in 2006, the year the Heckman lawsuit was filed. The settlement calls for Williamson County to set up systemic assurances that appointment procedures will be transparent and that defendants will not be “encouraged to waive the right to counsel or communicate with the attorney representing the State of Texas until pending requests for counsel have been ruled upon.” However, before going through the specifics of the settlement, the 6AC takes the opportunity to explain how “no counsel courts” work in places like Williamson County. On April 5, 2006, Monica Maisenbacher was arrested for assault arising from a domestic dispute. At the time of her arrest, Ms. Maisenbacher was unemployed and “without income to pay for basic expenses, including rent, food, or utilities.” A former health care worker, Maisenbacher suffered from a “serious chronic illness” that kept her from working. Without medical insurance, Monica was already facing thousands of dollars in medical bills when she went before a Williamson County magistrate. In Texas, the courts of general jurisdiction are the district courts that, in criminal matters, have jurisdiction over all felonies and juvenile delinquency proceedings. The Texas Constitution also requires all counties to have a single “county court,” to hear state misdemeanors. However, the Legislature has statutorily allowed for the creation of “county courts at law” in more populous jurisdictions in which a single county court would be overwhelmed in hearing all criminal misdemeanor cases carrying a potential jail sentence. Williamson County, for example, has one (1) constitution court and four (4) county courts at law. But even before appearing before a county court of law, a person arrested on a misdemeanor carrying a potential jail term is brought before a magistrate to determine whether there is probable cause to support the charge, set bail, and inform accused of his or her rights. In Williamson County, this hearing takes place at the county jail – out of public view – and shortly after the accused is arrested. If the magistrate finds that there is enough reason to support the charge, the magistrate sets bail. If the person can make bail, the defendant is released pending an appearance in the county court of law. If not, the defendant will sit in jail at taxpayer expense pending his or her next court date (and most likely through trial if the case goes that far). As was the typical practice at the time, “Ms. Maisenbacher appeared before a magistrate at the Williamson County jail. The magistrate did not inform Ms. Maisenbacher that she had a right to a court-appointed attorney, did not provide any information about how to apply for a court-appointed attorney, did not provide forms that would allow Ms. Maisenbacher to ask for a court-appointed attorney, and did not inform Ms. Maisenbacher of the county or state standards for determining financial eligibility for court-appointed counsel.” Monica Maisenbacher requested an attorney anyway, but did not receive one. As alleged in the lawsuit, the court’s arraignment docket for in-custody defendants begins when the “presiding judge orders a bailiff to bring a few of the accused out to the courtroom at a time” where they “are taken to a table in order to speak to a prosecutor about their case.” The prosecutors proceed to discuss plea deals with unrepresented defendants, including suggesting they each waive their constitutional right to counsel. All of this occurs before the defendant has an opportunity to address the court and ask for counsel. If the defendant agrees to waive counsel and accept a plea deal, then the court will formally arraign the defendant to enter the plea. Those that still want counsel are told that “they will be ordered to pay the cost of appointed counsel at the conclusion of their cases and that appointed counsel therefore is not really free. The presiding judge does not explain to the accused that they will not have to reimburse the state for the cost of court-appointed counsel if they cannot afford to do so or that the cost of appointed counsel cannot be assessed if the accused is not convicted of the charged offense.” Fearing excessive legal fees that they cannot afford, many defendants who want counsel decide not to invoke their right to counsel. At no point in the process is there a defense lawyer present to consult or advise the defendant. A similar process is employed for out-of-custody defendants, like Monica Maisenbacher, though there is an added wrinkle. “A bailiff is standing at the door to the courtroom and tells people attempting to enter the courtroom that only persons with cases on the docket are allowed in the courtroom. The bailiff tells family members of the accused and members of the public that they are not allowed to be present during the court proceedings.” This means that a family member cannot view the coercive approach to uncounselled plea negotiations or assist the defendant in deciding his fate. As was the typical practice, the court allegedly “encouraged Ms. Maisenbacher to plead guilty or no contest without consulting an attorney, and encouraged her to speak to prosecutors without the aid of an attorney.” Ms. Maisenbacher refused, and asked for an attorney. “When she requested a court-appointed attorney, the court asked, ‘Why should Williamson County pay for your mistake? You look like you can work.’” The Court eventually had her fill out an affidavit of indigency, but took no action. A month later when the class action lawsuit was filed, Monica Maisenbacher was still without counsel. One of the county court at law judges finally appointed counsel in her criminal case, within hours of learning that the Texas Fair Defense Project filed the lawsuit. With the guiding hand of counsel, the charges against Maisenbacher were dismissed altogether later that month. After the dismissal of her criminal case, Monica passed away from her illness while the class action case was still on interlocutory appeal. We should note that Williamson County settled the lawsuit without an admission that “any judge or court or combination of judges and courts has engaged in the acts or omissions alleged in the petition,” to avoid “further conflict, additional costs, and expenses associated with continued litigation at the trial court and any future appeals.” Still, the terms of the settlement certainly aim to correct the systemic deficiencies that were alleged preventing defendants from receiving their constitutional right to counsel. To begin with, Williamson County is prohibited from barring public access to the all court proceedings, including the article 15.17 hearing commonly referred to as a “magistrate hearing” as well as the defendant’s first appearance. And, the court must make available video access to the proceedings should the courtroom not be able to seat everyone. Attorneys representing defendants must now be provided with a defendant’s contact information “so that the attorney may make every reasonable effort to contact the defendant no later than the end of the first working day after the date the attorney is appointed, in accordance with Article 26.04(j) of the Texas Code of Criminal Procedure.” No waivers of counsel can be accepted without the judge discussing on the record a defendant’s right to the assistance of counsel in plea proceedings, and the defendant’s right to appointed counsel if the defendant is not financially able to employ counsel. And, a defendant cannot be made to discuss the case with a prosecutor before formally waiving counsel. In United States v. Cronic, 466 U.S. 648 (1984), the U.S. Supreme Court stated that of “all the rights that an accused person has, the right to be represented by counsel is by far the most pervasive, for it affects his ability to assert any other rights he may have,” before detailing the systemic deficiencies that make the criminal justice system lose “its character as a confrontation between adversaries” making the system itself constitutionally inadequate. Preeminent among such deficiencies is the systemic denial of counsel altogether – like the “no-counsel courts” described above. According to the Cronic Court, the “presumption that counsel’s assistance is essential requires us to conclude that a trial is unfair if the accused is denied counsel at a critical stage” of his case. The prevalence of “no-counsel courts” is not strictly a Texas phenomenon. Indeed, it is an all too common practice in many lower courts of various states throughout America. 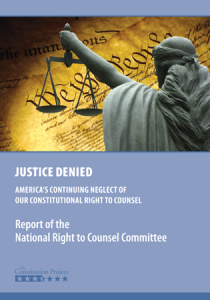 The Constitution Project’s seminal report, Justice Denied: America’s Continuing Neglect of our Constitutional Right to Counsel, details no-counsel courts in jurisdictions as varied as Georgia, Illinois, Indiana, Mississippi, Ohio, Rhode Island and Washington. The National Association of Criminal Defense Lawyers (NACDL) report, Minor Crimes, Massive Waste, details no-counsel courts in Arizona, California, North Dakota, and Tennessee, among others, while the NACDL report Three-Minute Justice: Haste and Waste in Florida’s Misdemeanor Courtsgoes in depth on the problem of no-counsel courts in some parts of that state. The National Legal Aid & Defender Association (NLADA) goes to similar lengths to note the existence of no-counsel courts in Idaho and Michigan. Unfortunately, people who plead guilty in these widespread no-counsel courts have no real remedy to address systemic failures under Cronic and so the injustices are allowed to continue. Because no-counsel courts often deal strictly with misdemeanors – where jail time is in shorter increments and defendants often accept plea deals to time served in order to get out of jail – there is not the impetus to attack these Cronic failings in individual cases. So, ignorant of the appellate process – including the Court’s 2005 decision determining that people who plead guilty still have the right to an attorney to challenge their sentences and review the trial-level process – most no counsel defendants simply move on to deal with all the collateral life consequences that come with a guilty plea alone. And, even for those few hearty souls who do seek to use the appellate system, it is often the case that Cronic issues cannot be raised until the post-conviction phase – a time at which defendants no longer have a constitutional right to an attorney to assist them with their appeal. So, places like the Texas Fair Defense Project turn to so-called “1983” class action lawsuits – a process that has now taken over six years to fix no-counsel courts in just one of Texas’ 254 counties. No wonder our criminal justice systems remain broken in the 50th anniversary year of Gideon v. Wainwright – supposedly requiring states to provide competent counsel to people who do not have the resources to retain private attorneys. “Persons who are accused of crime and denied the right to counsel face an increased risk of being convicted of crimes they did not commit, leaving the public at continued risk from the true perpetrators of those offenses. All the facts of Monica Maisenbacher’s case are those detailed in the Texas Fair Defense Project’s 2006 petition.